These bats aren't just your ordinary, run-of-the-mill variety. Oh no! 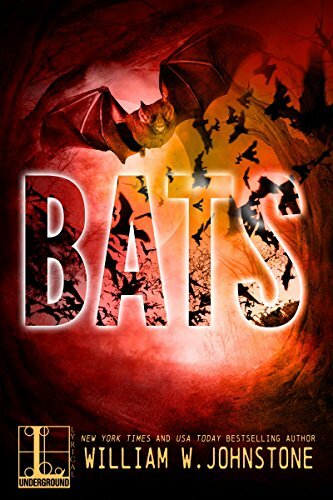 These bats are enormous, mutant, vicious and they're baying for human blood. They're able to think and strategise. They attack en masse. They spread rabies indiscriminately. What has caused this mutation and how will the people of Louisiana defend themselves against this seemingly indomitable foe? Local resident and fearless ex-spook Johnny is on a mission to obliterate the bats before they obliterate humanity. 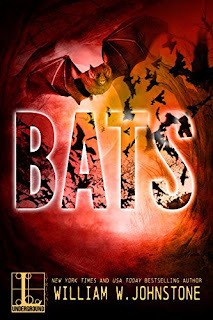 Bats is great creature feature tale; originally written and published in paperback format in the 90s. It's now one of an increasing number of 'old school' books being made available in digital format. This is something I personally welcome and I'm sure will open up a whole new audience. I thoroughly enjoyed Bats. It reminded me of the horror novels I used to read as a teenager in the 80s. Yes, the characters are stereotyped - the lawmakers continually obstruct all moves to destroy the land where the bats nest and the law enforcers face bureaucracy at every twist and turn. The tv reporters are unhelpful and dismissive; while the townsfolk are narrow-minded and unbelieving. Throw a few devil worshipers into the mix and you've got a whole lot of crazy going on! They’d flown north from Central and South America, appearing one day in the southern wetlands of the U.S. like ominous ink stains in the twilight sky. With each sunset, more appeared, first hundreds then thousands. Massing into a great black cloud of terror, the vampire bats were beating their wings in time with the panicked heartbeats in the towns below. No one knew how to stop them as they fell onto their prey like dark, deadly shadows. But someone had to find a way. Because somewhere in the night, they had become a threat to more than wild animals and livestock. Somewhere in the night madness took hold as these vampire bats developed a taste for human blood. And the feasting had only just begun.